Ring-Fencing - What Does It Mean? What is "ring-fencing"? 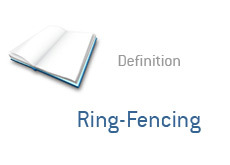 What is the definition of "ring-fencing"? "Ring-fencing" refers to the "walling off" of assets. A wealthy investor may "ring-fence" a number of assets in a tax haven. A company may "ring-fence" poorly performing assets via a split in their company (for instance, a good bank / bad bank scenario). During the financial meltdown of 2008, some companies asked for the government to "ring-fence" certain poorly performing assets in order to move ahead with a merger. For instance, the government asks XYZ to consider taking over ABC. ABC has a number of hard-to-value mortgages on its books (let's say Option ARM mortgages). XYZ may ask the government to "ring-fence" these mortgages in order to consider taking over ABC. In this case, they would be asking for these mortgages to be separated from the company so that the government could worry about them. "Ring-fencing" can apply to many different circumstances, but it usually refers to separating or "walling off" assets within a company.